To help us complete the numerous environmental and educational programs in the area, LEA relies on a host of dedicated volunteers. We are always excited about working with new people and we have a variety of different ways in which volunteers can help out. We greatly appreciate the time volunteers give us and we try hard to match volunteers with appropriate and interesting tasks. If you are interested in volunteering at LEA, please fill out this survey! The activities listed below are just a few examples of how you can help us protect our waterbodies and their surrounding ecosystems. Holt Pond Stewards are individuals who enjoy exploring the preserve and would like to share their knowledge with others. This job entails wandering around Holt Pond and talking to people about places of interest in the preserve, wetlands ecology, LEA history and philosophies, and use guidelines. The steward will offer to lend relevent texts and field guides and equiptment from from LEA’s lending library backpack. In addition, the Holt Pond Stewards will keep track of busy times/days during the year by tallying use data. 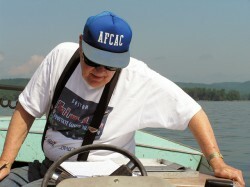 Volunteer lake monitors provide assistance to staff and interns collecting lake data. Lake Monitors can take Secchi disk readings (a measure of water clarity), go out water testing with LEA staff and interns or provide a boat or canoe for use during sampling sessions. Join the statewide fight against milfoil and other invasive plants by becoming a courtesy boat launch inspector. Inspectors schedule volunteer sessions last 3 or more hours, at any time or day during the week. The job entails being at a local boat launch to talk to people about the threat of invasive plants and how to prevent them from spreading. Anyone can become a trail adoptee including individuals, families, friends, and school and camp groups. Volunteers may adopt sections of either Holt Pond Preserve or the Stevens Brook Trail, conducting trail inventory throughout the year, as well as simple trail upkeep. By adopting a section of trail, volunteers are helping to keep our trails accessible for others to enjoy. LEA hosts several special events during the year, such as the Hey You! Cruises for sixth graders, Steven’s Brook Clean-Up, Earth Day Celebration, the Annual Meeting, the Holiday Party, After-hours receptions, and others. Special Events Volunteers help plan and implement these programs.